There is a very simple test to show MySQL replication in action and to also better understand the basics of MySQL Replication. With a configured MySQL environment we can run the following test on your MySQL master, and monitor the MySQL slave. If you would like to try this, you can use MySQL SandBox which can launch a MySQL Master/Slave configuration in seconds. You can get started with MySQL Sandbox and Download 3.0.04. We will use a modified version of the numbers procedure found at Filling test tables quickly as our test program. This simple command monitors the replication process dynamically and gives a highlighted output during the process. You will notice different highlighted sections during various stages of the replication process. Mark Leith, on of the MySQL Support Team managers wrote some time ago a very nice utility I use often called Statpack. My use of Statpack is very simple. Take two snaphots of SHOW GLOBAL STATUS and compare to produce a text based version of the statistics. Over time I’ve grown to love it’s simplicity, but notice a number of shortcomings. Being open source there is always the ability to modify, improve and give back. This post is more about detailing those little annoyances that I’d like to improve, or see improved. It is also a means to collate points into one location that I often forget about over time. I welcome any input, and specifically help in this open source venture. Here is my wish list that I can currently remember. I do plan to action, time permitting. In Statement Activity, the total percentages are great to determine Read/Write ratio, however the ratio is for the Total, not for the period. I’m not sure how best to present, but would be good to know. See Exhibit 1 for a good example. When sections are not used, e.g. all ZERO values, then suppress for ease of reading. See Exhibit 2 for examples of Prepared Statements and Query Cache, where a simple line like No Prepared Statements activity, or Query Cache not enabled. Incorporating SHOW VARIABLES output. If this is included in one file, then adding some information may be very valuable when reviewing these audit files. For example in the InnoDB Buffer Pool show innodb_buffer_pool_size. In InnoDB Log Files show innodb_log_file_size, innodb_log_files_in_group, innodb_log_buffer_size. This can be used in most sections. See Exhibit 3 for an example. Incorporate a Date/Time in the report output. Again for historical purposes, at worst it could be the time the output is generated, however this is only an approximation. With SHOW GLOBAL STATUS output from my hourly.sh monitoring I include the following line before each SHOW STATUS output. ‘| date_time | 090611.161511 |’. Note to Drizzle Development team, please add date/time output to SHOW GLOBAL STATUS and SHOW GLOBAL VARIABLES. Negative numbers. There are occurrences when negative numbers occur, due to the wrapping of status numbers. See Exhibit 4 for example. Bug I’ve raised about divide by zero error when the same file (operator error) is specified. Baron got a great amount of response from his 50 things to know before migrating Oracle to MySQL. I’m glad I invited him as a fellow MySQL colleague to my presentation to the Federal Government on Best Practices for Migrating to MySQL from Oracle and SQL Server for his inspiration. Oracle will always be a more featured product then MySQL. There are however features that MySQL has that Oracle does not. While I’ve got a draft of a list of my own, I have several hundred incomplete drafts. One of these features I was able to demonstrate to a client is the ability to have multiple VALUES clauses for a single INSERT statement. For example. Does it make a difference? What is the performance improvement? The number one reason for an improvement in performance is the lack of network latency for each command. We ran a number of tests in a specific example for the client, taking multiple single insert statements, and combining into combined statements. We ran tests across localhost and also a network test. It was found that taking several thousand INSERT queries and combined into a maximum of 1M packets made sense. Overall this single test showed a 88% improvement from 11.4 seconds to 1.4 seconds. Recently I came across another configuration option I’d not heard of before. I profess to not know them all, however I do know when I find something unusual. If you are a beginner DBA, learn what is normal and expected, and identify what is out of the normal, investigate, research and question if necessary. I gave away a MySQL Administrator’s Book based on seeing a configuration with safe-show-database, an option I’d not seen before, and then requesting people giving basic configuration options in that situation. If this option doesn’t yet do anything, why is it there? Does it actually do something and the documentation is misrepresenting the option? Did it provide some feature or functionality before? I know MySQL has a number of features where are not fully featured or even production strength in a production environment. This makes me wonder how many more parameters, options or features exist but don’t actual do anything or work as designed! I then also question where organizations or people come up with using these options when the basic required options are not in place. Sometimes just using the basics is the best practice to start with. The first O’Reilly Twitter Boot Camp – #OTBC was held in New York as a pre cursor to 140 Characters Conference – #140conf on Monday 15th June, 2009. With opening and closing keynotes were like matching bookends of The Twitter Book #twitterbook offered to all attendees and authored by the keynoters @timoreilly and @SarahM. Attendees came from across the country. Just a few I spoke with coming from LA – @EricMueller of @FLWbooks, Texas – @marlaerwin , Vancouver – HootSuite, Las Vegas -zappos, Boston – @mvolpe , Philadelphia, @SBrownCCI from Cincinnati and @sticky_mommy from Vermont. The demographics of attendees was a little different from my usual O’Reilly conferences of MySQL, OSCON and Web 2.0. There were less the half the attendees with laptops at hand for notes & twittering, offset by the high blackberry or should I say shaq-berry users (Thanks Ami @digitalroyalty), easily seen from the back of the steep and dark auditorium. A greater proportion of different industries and gender lead to many questions and discussions from users, not just technologists. The morning panel sessions afforded no question time due to speakers providing good but overtime content. Over lunch Mike Volpe of HubSpot a corporate sponsor for the day set the standard by asking his panel of speakers to stick on time. This afforded almost 30 minutes of question time and a roar of approval from the crowd. 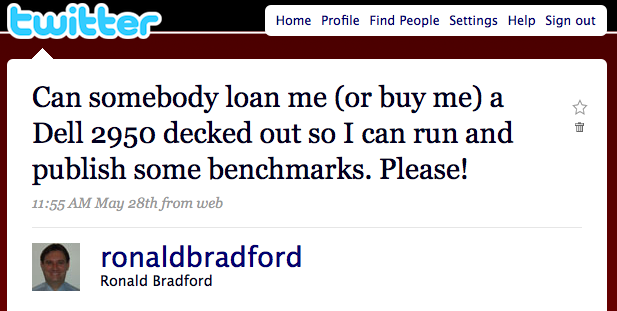 My individual brands of @ronaldbradford and @MySQLExpert will certainly benefit from a wealth of knowledge of the day. If only I had my Twitter name on the tee shirt I was wearing for the event. The only down sides to the venue the lack of power for attendees, flaky Internet and a basement auditorium with no cell phone service. Important things to re-consider for a online technology conference. In true form the attendees including myself @ronaldbradford, @SBrownCCI, @GeekGirlCamp, @14str8 used the medium of the conference and our voices were heard and some limited power made available. Thanks O’Reilly for listening. Thank you to all speakers @katmeyer, @timoreilly, @steverubel, @zappos, @carribugbee, @twittermoms, @flwbooks, @davidjdeal, @bethharte, @dunkindonuts, @reggiebradford, @wholefoods, @tedmurphy, @adbroad, @digitalroyalty, @erictpeterson, @mvolpe, @laureltouby, @sarahm and to Zappos.com for the after event happy hour. I have been working recently with Matt Yonkovit to get Waffle Grid cloud enabled with Amazon Web Services (AWS). An initial version of Waffle Grid Cream – Version 0.5 release is now available. We have elected to create one AMI for now, that is ready to be configured as either a MySQL Server, a memcached server, or as in the following example both. For this first version, we have also not configured MySQL or memcache, but rather provide a virgin Waffle Grid ready server for developers to experiment and benchmark with. Future releases will include custom AMI’s and the automated ability to register new memcached servers with the Waffle Grid enabled MySQL server. We assume you have created an EC2 account and are using one of the many tools available to launch images. The AMI you want to launch is ami-0575936c. This is an Ubunut Intrepid 8.10 32bit small instance, and includes MySQL 5.4.0 beta and Memcache 1.4.0 RC1. $ ps -ef | grep -e "mysql" - "memcached"
$ mysql -uroot -e "SELECT VERSION"
$ mysql -uroot -e "SHOW ENGINE INNODB STATUSG"
The Innodb Status shows a new section. $ mysql -uroot -e "SELECT COUNT(*) FROM sakila.actor"
Verification will show the change of information in the INNODB STATUS output. You can also confirm stats in memcached. I discovered while compiling Wafflegrid today that by default, the Ubuntu binaries for memcached are not-multithreaded. By installed the Latest RC 1.4.0 we see. Thanks Matt for pointing that one out. Seem’s the year Sun had for improving MySQL, and with an entire new 5.4 branch the development team could not fix the autoconf and compile dependencies that has been in MySQL for all the years I’ve been compiling MySQL. Drizzle has got it right, thanks to the great work of Monty Taylor. I’m working on the Wafflegrid AWS EC2 AMI’s for Matt Yonkovit and while compiling 5.1 was straight forward under Ubuntu 8.10 Intrepid, compiling 5.4 was more complicated. For MySQL 5.4, I elected to use the BUILD scripts (based on Wafflegrid recommendations). That didn’t go far before I needed. You then have to go compiling MySQL 5.4 for 10+ minutes to get an abstract error, then you need to consider what dependencies may be missing. I don’t like to do a blanket apt-get of a long list of proposed packages unless I know they are actually needed. ylwrap is part of yacc, and by default in this instance it’s not even an installed package. I’ve compiled MySQL long enough that it requires yacc, and actually bison but to you think it would hurt if the configure told the user this. It’s also been some time since I’ve compiled MySQL source, rather focusing on Drizzle. I had forgotten just how many compile warnings MySQL throws. Granted a warning is not an error, but you should not just ignore them in building a quality product. For any production MySQL Database system, running RAID is a given these days. Do you know what RAID your database is? Are you sure?. Ask for quantifiable reproducible output from your systems provider or your System Administrator. As a consultant I don’t always know the specific tools for the clients deployed H/W, but I ask the question. On more the one occasion the actual result differed from the clients’ perspective or what they were told, and twice I’ve discovered that clients when asked if their RAID was running in a degraded mode, it actually was and they didn’t know. You can read about various benchmarks at MySQL blogs such as BigDBAHead and MySQL Performance Blog however getting first hand experience of your actually RAID configuration, the H/W and S/W variables is critical to knowing how your technology works. You can then build on this to run your own benchmarks. Over 50% of my clients run on DELL equipment, most using local storage or shared storage options such as Dell MD1000, Dell MD3000, NetApps or EMC. I’ve had the opportunity to spend a few days looking into the more details of RAID, specifically the DELL PERC 5/i Raid Controllers, and I’ve started a few MySQL Cheatsheets for my own reference that others may also benefit from. Understanding PERC RAID Controllers gives an overview of using the MegaCLI tools to retrieve valuable information on the Adapter, Physical Drives, Logical Drives and the all important Battery Backed Cache. There are several Google search results out there about finding the MegaCLI tools, I found them to be all outdated. There is of course other tools including Dell OpenManage Server Administrator (GUI and CLI) and an Open Source project called megactl. The big detail that was missing was the details in this ouput of the drive speed, such as 7.2K, 10K, 15K. What is the impact? Well that’s the purpose of the next step. Following this investigation, testing of the RAID configuration with Bonnie++ was performed to determine the likely performance of various configurations, and to test RAID0, RAID1, RAID5 and RAID10. Further testing that would be nice would include for example RAID 5 with 3 drives verses 4 drives. The speed of the drives, the performance in a degraded situation, and the performance during a disk rebuild. This still leaves the question about how to test the performance with and without the Battery Backed Cache. You can easily disable this via CLI tools, but testing an actually database test, and pulling the power plug for example with and without would yield some interesting results. More concerning is when Dell specifically discharges the batters, and it takes like 8 hours to recharge. In your production environment you are then running in degraded mode. Disaster always happens at the worse time. If you had to configure a WordPress MU installation without access to any details of your MySQL Configuration, what would you do? What top five configuration settings would you use? I asked the community this question, see For MySQL DBA fame and glory. Prize included and a number of brave soles responded for a chance to win a free copy of MySQL Administrators Bible by MySQL Community She-BA Sheeri Cabral. There is no perfect answer and of course you would want to set more then five options, however the purpose of the competition was to seek what people would do with limited information and a limited choice of actions to enable people to focus on what is important. Give an answer with five options. That was the question. WordPress MU gives you an indication of the schema size (about 300 tables), the default storage engine of MyISAM, and the technology stack includes PHP. The current MySQL configuration included just two existing options. If I was asked this question, here is what I’d do. Demand more information about the H/W the Mysql server running on. I also would do my own physical verification as client description != actual implementation. Confirm if the server is shared or dedicated. Get SHOW GLOBAL VARIABLES output. Get 2 x SHOW GLOBAL STATUS output, separated from some time, e.g. 1 minute, 10 minutes, 1 hour. Without the above information I’m not really prepared to tune a system in isolation. I’ll spend more time at a later time explaining why. So my answers for reference. We have as a pre-cursor to the top 5, the key_buffer_size. The key_buffer_size is used to store MyISAM Indexes, and is assigned as MySQL server startup. Setting this value to large is a waste of space, setting this too small will increase the amount of disk I/O. In this example, the total index space was around 100MB, so setting the value to 384-512M supports adequate growth. The default value for 5.0.67 is 8M. When you read on, see point 5, you may well consider lowering this value. If you are storing data in a database I’m sure you want to keep it. log-bin is necessary for point in time recovery. Period. You should also specify the actually path, and store this outside of the default MySQL data directory. The default is NOT enabled. MyISAM is not the most optimal storage engine for online systems. This is a much larger discussion however for the stock default WP and general LAMP products we start with MyISAM. Setting myisam_recover will improve one disadvantage of MyISAM and that is the recovery on startup. The default is NOT enabled. In absence of greater information, enabling the Query Cache in a generally high read environment is a good starting point. You have the ability to set and unset this dynamically on a running server, so it is easy to remove if performance is not the optimal. You should also not go overboard with the size of the query cache. Start with a modest amount, such as 64M, assess the impact of the QC and re-assess the value. The default is NOT enabled. The Query Cache also uses the variables query_cache_type, which defaults to ON, and query_cache_limit which defaults to 1M. The MU part of the WordPress is a trigger that the system will have several hundred tables. Monitoring Opened_tables, and Open_tables is as easy check to determine a more appropriate table_cache value. The default value on 5.0.67 is 64. This was a difficult choice, the first 4 are obvious for the current environment. I have to question the reason why max_connections=500. Given that there is no other configuration settings, why would this value be so large. Start with a more realistic figure, such as the default of 150, and monitor max_used_connections, threads_running for a while. A review of the H/W confirmed this is unrealistic, the system has 16GB of RAM, but only a 32bit OS. Tuning MySQL is not a trivial or simple task. It takes a certain amount of knowledge about the system. Recently I have seen some very unusual MySQL configurations, and I have to pass on this information for all readers and DBA’s. Gather information about your environment, and the setting in question before making a change. Document this on an internal wiki. It is important, when in a year’s time somebody asks, why did you change this? The bonus prize was for anybody that questioned the current configuration which only included two parameters. I had to look up –safe-show-database. No wonder I didn’t know it, Deprecated since 4.0.2. I wonder sometimes when people add uncommon options. Shlomi the only person to at least raise a ? on that on. And the winner, I had to consider 3 people that had 3 of my 5. Shlomi Noach made such a plea I have to give it to him, and I’ll throw in international shipping. Be sure you to check out some of my research including Understanding your RAID Configuration and Understanding PERC RAID Controllers. Last week I got caught thinking a MySQL production system wasn’t configured with RAID when it actually was. The following is the Linux dmesg output of 3 different client MySQL servers, where the H/W is all the same, a Dell 2950. In the first two cases you will see individual references to the internal disks, however in the third you do not. This threw me, but as Matt Yonkovit correctly pointed out to me, the sizes are not standard drive sizes. A deeper level of understanding via CLI tools, or actually console output would appear necessary to understand the disk configuration in the future. May 2009 – Dell 2950 running RHEL 5. Note no individual drive details, only partition sizes for sda (300G) and sdb (600G). In a same day response I was offered access to use 2 x Dell 1950’s, and today I’m now actually using these machines for my own testing. I would like to thank cafemom (Barry, Anthony & Dan) for the loan of hardware. And now the chance to better understand the RAID configuration of the DELL PERC Controllers, trying out some different RAID types, LVM configurations and disk tests. When I’m done with my System Administrator refresher, I’m then be trying some different MySQL Benchmarks to test various MySQL configuration settings including using the new Juice benchmark.